Hope’s joke reflected just how a big a star Michael Holliday was at that time. He had started out on the show business ladder over a decade earlier, singing with dance bands at the Butlins Holiday camps, before joining the prestigious Eric Winstone Band in 1953. Two years later, he made his breakthrough on BBC Television and a record contract with EMI Columbia soon followed. He was soon in the Hit Parade and in January 1958, gained the coveted No. 1 spot with “The Story Of My Life”, one of the first songs produced by the partnership of Burt Bacharach and Hal David. More hits and another No. 1, “Starry Eyed”, followed plus his own BBC TV show “Relax With Michael Holliday”. The relaxed image concealed a troubled and tormented individual, forever seeking fame and adulation, alongside seclusion and privacy. Constantly battling depression and living a personal life that was anything but stable, the private Holliday was a total juxtaposition of the public image he created. All of which added to the shock when the British public opened its newspapers on October 30, 1963 to discover that Michael Holliday was dead at the age of 38. 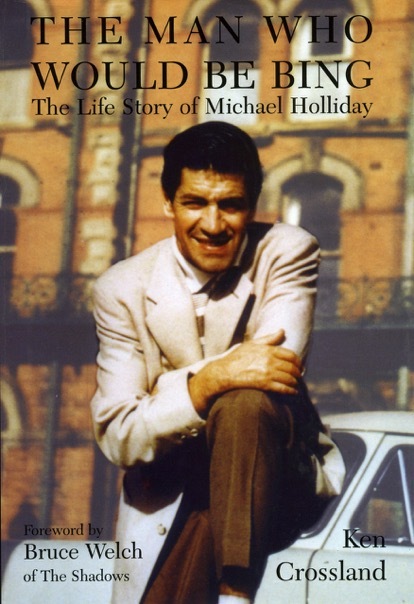 My chronicle of Holliday’s turbulent life - The Man Who Would Be Bing - The Life Story of Michael Holliday was published by The Book Guild in 2004.